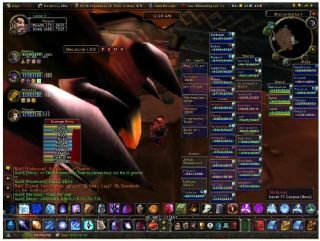 World of Warcraft is only available on PCs... need we say more? While Xbots and the Sony Defence Force argue among themselves, and Wii-mers (Wii-ers?) throw ever more ridiculous shapes pretending to play the tambourine or something, there is another group of gamers who quietly, happily, enjoy the best gaming platform yet invented - the PC. And while, granted, some huge percentage of PCs are never used for anything other than Outlook and basic web, PCs remain the most flexible and happiest way to game. And, unlike Wii Sports, it won't cause you permanent physical damage. Well, duh. Console kids who have grown up with a controller in hand might argue, but there's still no better way of playing just about any game in any genre – not just shooters – than the combination of keyboard and mouse. It just works, offering orders of magnitude more precision and speed than fiddly analogue sticks. While Microsoft and Sony scream about 'true HD' in their games – but in many cases don't actually deliver it – the PC has been happily running games at 1080p and above for yonks. In fact, the near-HD default res of 1,280x1,024 is very 2001; even a medium rig can handle 1,600x1,200 or more these days. Were you a raw naif, you might be forgiven for thinking that LittleBigPlanet et al single-handedly invented the idea of (nnnggh) 'user generated content'. But guess what? PC gamers have been coding mods (modifications) such as add-ons, total conversions, unofficial levels and all manner of other gubbins for… well, pretty much forever. And then distributing it for free, for the sheer love of it. With the aforementioned higher resolutions and textures, chances are a new PC game already looks better than its console counterpart right now. But even if you can't run it with all the visuals tweaked to the max, processor and graphic cards prices drop so quickly that it's hardly bank-breaking to refit your rig in a year or so, for better graphics and more speed. Sony, Microsoft and Nintendo's licensing and publishing costs inevitably drive up the cost of every single game released, and even pre-owned games tend to be far pricier than the PC equivalent. Imagine not having to rely on a single, central server such as Xbox Live or PlayStation Network whenever you go online. Imagine not having to suffer downtimes, silly licensing agreements, or daft console-restricting DRM. Oh wait… that's the PC online, isn't it? Okay, this only applies to Xbox Live, but who's to say that Sony might not start charging for PSN as it keeps haemorrhaging money? And yes, Xboxers can use the free Silver service, but really – why would you? The Xbox 360 is limited to whatever can fit on a DVD (or, if you're unlucky, more than one). The PlayStation 3 has to struggle with turgid Blu-ray access and enforced installs. PC games, meanwhile, just sit happily on the potentially unlimited storage space of your hard drive. Easy. Like modders, PC gamers are rabidly enthusiastic about pulling apart save games and data files, fiddling therein, and finding ingenious ways to cheat or fix corrupted files. Try doing that with your Wii. PC games such as Vampire: The Masquerade often get unofficial, free, support long after publishers have gone kaput and official support is abandoned, thanks to the tireless efforts of their fans. Bug fixes, enhancements, new hardware support – it's all there. The geek term for 'old games which you can't buy any more'. There are a huge number of classic PC titles out there from years gone by, and many thousands are available to download, legally, for free. Well, you only get this on the Xbox, of course, but the last thing you want your gaming machine to do is to completely konk out. At least when a PC goes wrong, it really goes wrong. Like, with fire and everything (possibly). Now read 5 graphics cards that will knock your socks off.